I am impressed by the level of detail Neonode’s 10K goes into in terms of its customers, the market it operates in, and the very relevant risks to the business. One of the key criteria that Buffet looked for in his fundamental valuation of companies was whether the company’s management gave detail on the drivers for the industry and their company. So, I was excited to see that Neonode was asking and answering the right questions preemptively. My hope was then shattered when I dove deeper into their numbers. The company is clearly trading on its future potential. But this is not a discussion of stock price, but a stripped down analysis of whether the company has substantial value. Let’s begin with who Neonode is and what they do. Formerly known as SBE, Inc, incorporated in 1997. Merged in August 2007 with Neonode . Company continued operating as Neonode with principal office in Stockholm, Sweden, and US office in San Jose, California. Optical touch solutions under the brands zForce and MultiSensing. They have a portfolio of patents, but the touch screen functionality itself is not proprietary and thus they face many competitors. As of Dec 31, 2015, Neonode had 40 technology license agreements with global original equipment manufacturers (OEMs) and original design manufacturers (ODMs). This is an increase from 35 at Dec 31, 2014, which is also an increase from 33 at Dec 31, 2013. 16 of those customers are shipping products they’ve made using the technology license and more to enter commercial markets . Neonode’s touch technology is incorporated into products such as laptops, touch-screen monitors, printers, GPS devices, e-readers, tablets, touch panels for automobiles, household appliances, mobile phones, wearable electronics, games and toys. 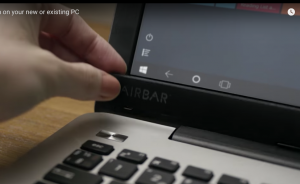 In addition to licensing their technology, Neonode has launched their first consumer product called AirBar, which is a USB plug-in device that enables touch functionality directly on the screen of the non-touch PCs. It is actually a very cool product that I may think about getting – an airbar for my mac air. How it works is you place the AirBar on the bottom of your non-touch laptop/computer screen. 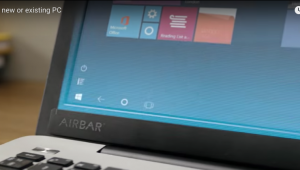 AirBar then projects an invisible layer of optical technology onto your screen, which then allows the screen to be touch-enabled. AirBar was announced in 2015 that it was in development. They begain manufacturing in 2016 and officially released in October 2016. It uses their zForce AIR sensing platform, the very technology that is licensed to many of their customers. Marketing the products to consumer electronics retailers, online stores, and resellers to the education and enterprise customers. Ingram Micro is their e-commerce, distribution and fulfillment partner. Also anticipating demand from PC OEMs to bundle AirBar with their non-touch notebooks. zForce DRIVE for detection of hands on steering wheel. Entered into agreement in 2015 to explore and industrialize. Also engaged with several global OEM manufacturers about developing automotive Human Machine Interface. But long development cycles of 4-5 years before any fees for licensing are collected. Entered into agreements with 5 leading global printer and office equipment companies including HP and Samsung. Production facility in Sweden. Distributed and fulfilled (including online e-commerce setup) by Ingram Micro to customers globally. A lot of heavy hitters for partnerships, but that isn’t reflected in their financials. Neonode’s revenues are unreliable as their technology can be replaced by their competition’s when the technology license agreement ends with the customer. For example, they had a blip in 2013 when they lost Amazon’s e-book reader business, but they’ve been able to gain back sales from other customers. In addition, their net revenue during the 9 months ended Sep 30, 2016 was lower by -10%, due to no engineering consulting service fees in 2016 as well as a decline in e-book readers. During this period, revenues came from 51% printers, 27% automotive, and 22% e-book readers, compared to 31% printers, 11% automotive, and 51% e-book readers during 9 months ended 2015. Their technology license fees are shifting away from low-margin consumer products such as e-book readers to high-scale and potentially standardized among multiple OEMs in the automotive sector as car manufacturers continue to infuse electronic gadgety type of products into cars. The concern is how high their costs are. They’ve reduced the number of corporate full-time employees from 8 in 2013, 7 in 2014, now down to 6 as of 2015 year end. Hopefully they will continue to operate under a lean, or even leaner, corporate team. No point in doing a discounted cash flow method for valuation since their revenues are too unpredictable forecast and they’re operating at a loss. Neonode’s comparables tell us that indeed their costs are way too high. The industry median SG&A cost as a percent of revenue is 13% and R&D as a percent of revenue is 18%. Neonode’s on the other hand is 79% and 56%, respectively. Their P/S and P/BV ratios are both not meaningful to even compare because of how ridiculously high they are. So far, the valuation of the company does not look great. They have a good technology and good partners, which is essentially what the company has. But in order for them to survive, they MUST cut down their costs. Revenues are highly dependent on the success of its OEM manufacturers. In other words, Neonode does not have a direct affect on the success of the end-user products or marketing and therefore sales growth. Revenues are highly concentrated in a few of their customers and the total # of customers they have is to major companies. Three companies represented 60% of revenues in 2015. For example, net revenue decreased from ~$7.1m in 2012 to $3.7m because Amazon did not use their technology for their e-book reader. Highly competitive space – in order for a commoditized product due to high competition to survive, have to choose between low price or high quality, and most often times, it is high quality that survives. (and continuous introduction of innovative products. R&D spend is not a measure of how innovative a company is according to this Forbes articles, but it gauges the growth of the company historically as a function of how much R&D they’ve spent and if they’re spending the same levels but the company has been declining, then obviously they’re doing something wrong. Hope they’re brewing some innovative products. If their sales don’t grow by at least 20%-50% by 3 years from now, then their R&D is not being spent to good use. Again, as noted above, their R&D % of revenue is more than triple that of the industry median. Even if development of new products take anywhere from 6 months to 36 months, the company is not at its infancy stage, so they should have proved their sales to support the levels of R&D spending by now. Big car markets by country that they have not penetrated yet include UK and Norway, two countries where electric vehicles are the most popular. Are there regulations or patents they have to file separately in those countries that are keeping them from making sales there? Virtual reality and augmented reality are expected to grow 181.3% CAGR from 2015 to 2020, in dollars that’s $5.2 billion to $162 billion (IDC report, Aug 2016). That doesn’t even include artificial intelligence which alone is expected to grow from $640 million in 2016 to $36.8 billion by 2025; that’s a 57-fold growth (Tractica report, Aug 2016). This is a growing opportunity. Aggressive sales should have started already. Hope they’re putting those huge sales and G&A costs to good use. First of all, the Company operates in a very competitive space, as evidenced by them losing Amazon as a customer for the Kindle e-readers, which affected the business by a -48% decline year over year. 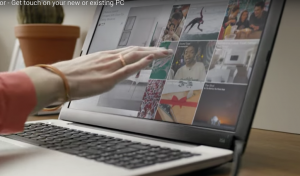 The launch of their first consumer product, AirBar, is very timely as it coincides with Apple’s new “touch bar” on their Macbooks, so they’re riding the coat tails of Apple’s marketing as an introduction to the product. But it is still not widely known, so they need to be doing some more online marketing of their product. As they stated in their filing, they’ve never mass manufactured products before, and they’re about to find out how good they are at it. Continue to supply optical touch technology to OEMs, aggressive sales efforts in existing industries including automotive, computer, printer, e-book reader, etc, but also in new areas in development including AR/VR, AI. A few other industries I’m thinking they could penetrate with touch functionality are fitness & gym equipment, health care/biotech medical devices, and smart home products to name a few. Continue to supply to OEMs but focus efforts on becoming a consumer brand, starting with AirBar. They could have a series of products ready to launch in successions. Get acquired by a computer electronics company, with some potential suitors being: Apple, Microsoft, Sony, Samsung. Get acquired by an ancillary consumer electronics hardware company such as Logitech, Razer, Facebook’s Oculus. Regardless of their path, I don’t see this company failing anytime soon. Even though they’re operating in a highly competitive space, they’ve positioned themselves very well in the market with OEM partnerships and there are ample opportunities for their technology to be used in various avenues.